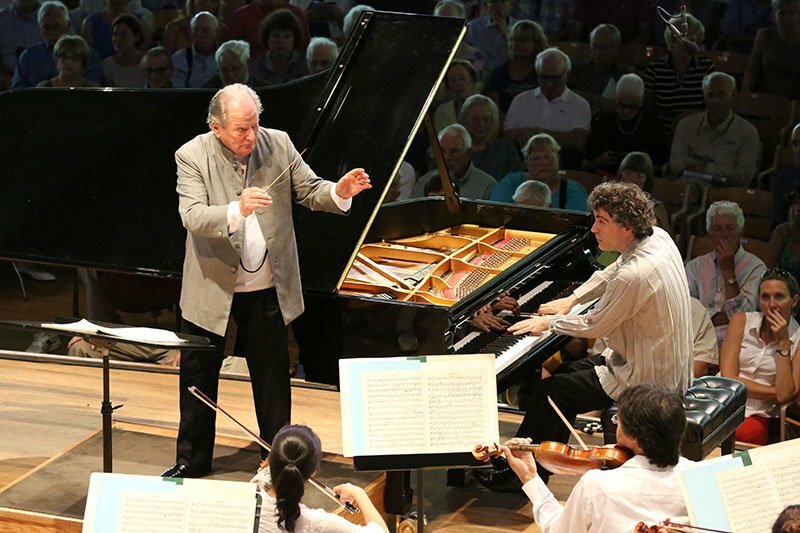 Despite high heat and humidity, not to mention low air pressure betokening an approaching thunderstorm (with tornado warnings), the 91-year-old Sir Neville Marriner, declining to conduct without his jacket while the Boston Symphony players were in shirtsleeves, led a superb Koussevitzky Shed performance on Sunday afternoon. Players and audience, to all appearances, enthusiastically cheered two popular Mozart symphonies along with Schumann’s Piano Concerto. The two symphonies both came from the year 1783, No. 35; the Haffner, debuted in March of that year, and No. 36, the Linz, in November. Though they were composed only about nine months apart, the Köchel numbers (386 and 425, respectively) indicate to some degree how busy Mozart was in that time, completing roughly 40 compositions. The two symphonies are among the most popular of Mozart’s symphonic works, barring perhaps the brilliant group of three with which he ended his symphonic writing in 1788. Marriner gave both vivid, clear, and joyous interpretations. But the highlight of the afternoon was an extraordinarily poetic reading of the Schumann Piano Concerto, one of the core works of musical Romanticism. Soloist Paul Lewis played with a flexibility of phrasing in the gentler, more lyrical passages while at the same time displaying all the virtuosity and steely fingers required for the big moments—they start immediately after a single chord in the orchestra with the piano’s opening gesture. And the Boston Symphony players responded to Marriner’s direction with the same well-matched lyricism and virtuosity. Especially striking was the gentle, expressive dialogue between Michael Wayne’s clarinet and the soloist during several passages of the first movement. Michael Steinberg’s note for this piece emphasizes how mercurial it is, how essential is the teamwork between conductor and soloist in the constantly developing dialogue, an element of concerto writing that was not at all common in Schumann’s day. One can hardly imagine a defter treatment of this aspect of the work than the execution of Lewis, Marriner, and the BSO. At the end of the first movement there was a smattering of applause—exactly what Schumann would have expected after a playing this good. Even after he had expanded the original one-movement form of the work into the full three-movement concerto that we know today, it was entirely expected in his time that the audience should applaud any movement that they found particularly pleasing. And this opening Allegro affettuoso was indeed pleasing. But so was the rest of the work. The slow movement is delicate and gracious, not unlike similar passages in the opening movement. It runs directly into the finale, which is adumbrated by a few quiet hints in the woodwinds and finally by a summons in the horns that was positively thrilling in context. The finale bundles energy with passing touches of delicate lyricism. The virtuosic passages play rhythmic tricks of three against two that anticipate Brahms, who adored Schumann’s music. The enthusiasm of the audience was almost boundless, bringing one recall after another of soloists and conductor. There was some talk of an encore by Paul Lewis, though this did not happen. Still what he offered was a rich gift indeed.